After reading Donalyn Miller's The Book Whisperer (which I HIGHLY recommend), I wanted to start the year off fostering a love of reading. I really wanted my students to take ownership of their reading, choose their own books and fall in love with our independent reading time. I used some of what Donalyn shared in her book and chose 10 Rights of a Reader. At the beginning of the year, I share these rights with the students and we briefly discuss them. Then throughout the year, I revisit and discuss the different elements so students are very aware of what they are able to do during our independent reading time. 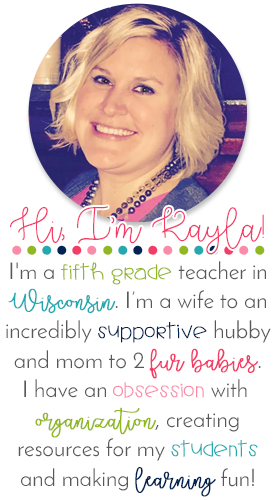 You can find the posters HERE in my Teachers Pay Teachers store! The blank letters are also available, as well as white background versions for easier printing. 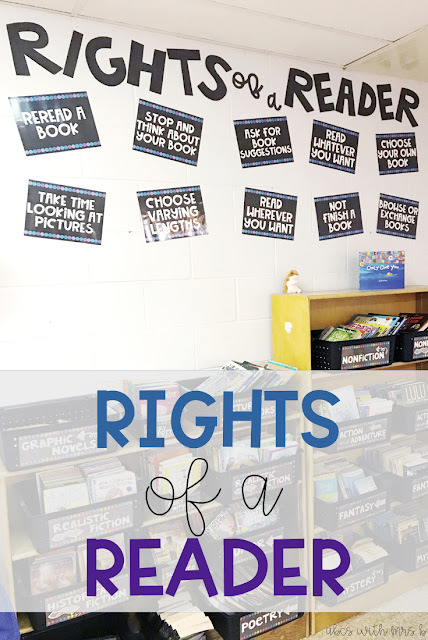 I love having these displayed in my classroom above my classroom library for students to reference so they know they are readers and have rights in their reading habits! 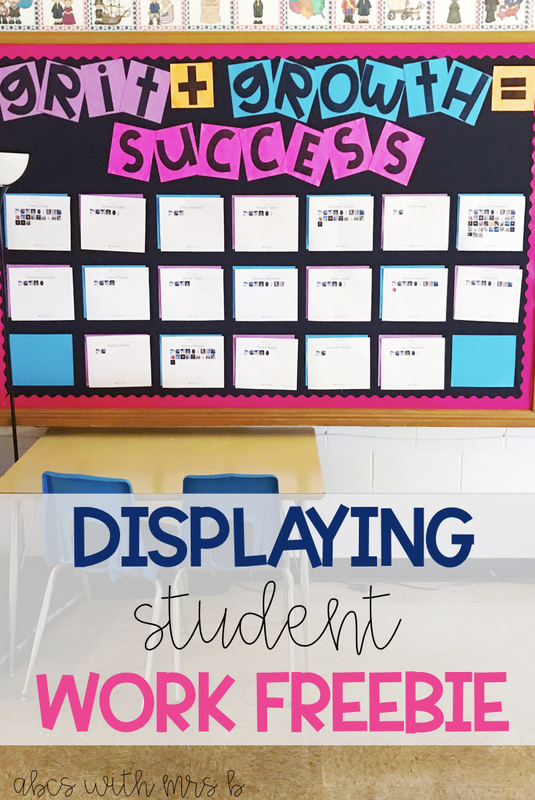 I always make sure I'm displaying student work in my classroom, as does about every teacher, right? We are really focusing on building grit and growth mindset in my classroom, so I wanted to tie a quote with the student work display. I created the quote Grit + Growth = Success on my board to make sure that students understand how important grit and growth are! You can find the words for FREE HERE. The options for work to display are completely up to you! On this board below, I post my students' Moby Max badges they have earned throughout the school year. You could post writing samples, math achievements, reading goals, etc! My favorite beginning of the year writing project is student autobiographies! It builds community in my classroom, builds writing stamina and is high interest. 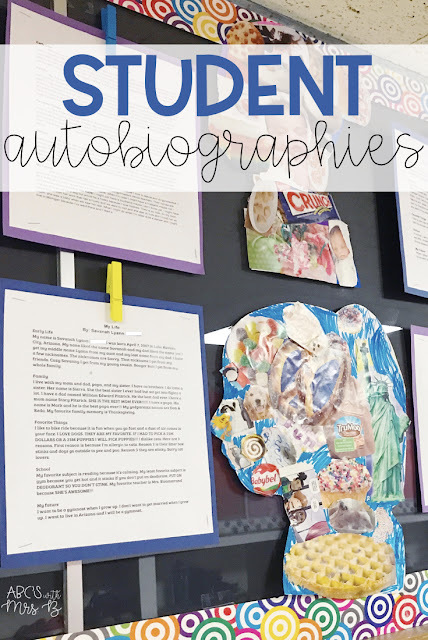 Before my students write their autobiography, I give them a planning page to start writing ideas. You can find the planning page for FREE HERE! I make sure to tell them to include more if they want! Also, some students don't want to include all the information on the planning page and that is okay, too! The planning page just gets them to start thinking about what to include and organize their writing. Now, after the planning page is completed, I make sure to tell them that I expect an organized 5 paragraph autobiography. Most of my students use the headings from the planning page to help them, while others are able to change theirs to make it their own. The planning page really just helps them get started and stay organized in their piece! Once we're done editing their autobiography, I trace their silhouette on a blank white piece of paper. You can easily do this by turning on your projector, have them stand in front of your board to make a shadow, tell them to stand very still (hard for some :)) and trace away. I chose to cut my students' silhouettes out to prevent noses being cut off, etc. Then I gave them stacks of magazines and told them to find pictures to create a collage that represented them. They had so much fun with this! Students started recommending ideas to other people or would ask the whole group if someone liked pizza because they found a picture of a pizza - it was super fun! Once students finished, I cut off the extra edges (turn the silhouette over and you can easily see if any of the pictures are overlapping) and then I had them use their favorite color to color in the white spaces if there were any. The finished products are perfect for right outside my classroom for the first quarter! So many teachers, parents and students have walked by to take a look! Such a great start to the school year!